Growing a coffee industry from the ground up, TechnoServe and Nespresso check off many firsts in the world’s youngest country. Started in 2013 through a partnership with Nespresso, TechnoServe’s program in South Sudan is increasing the livelihoods of smallholder coffee farmers and reviving the country’s coffee industry. In the process, the program has set 9 firsts in the industry and beyond. First coffee cooperatives registered in South Sudan - The project supported the organization and registration of three coffee cooperatives in the region of Yei, the first of their kind in South Sudan. First coffee wet mills in history of South Sudan - Coffee processing businesses, known as coffee wet mills, which transform the cherries picked by farmers into parchment coffee, are essential to produce high quality coffee. 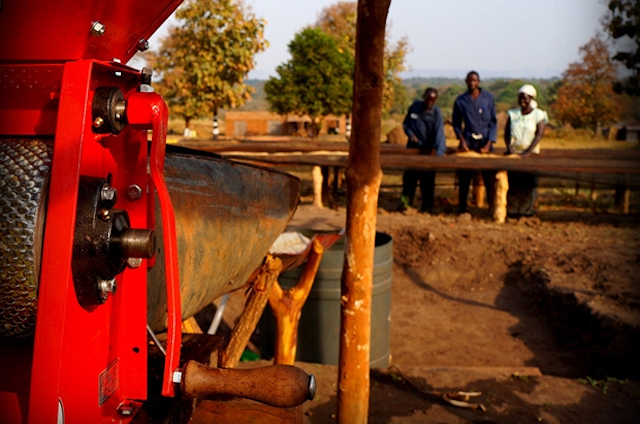 During 2013, the project supported each of the cooperatives to construct a coffee wet mill. First fully washed coffee ever produced in South Sudan - The cooperative leaders were supported to write a business plan and staff were trained and coached during the harvest season on operations of their new coffee wet mills. Previously, coffee was only processed with the dry method. First ever phytosanitary certificate for South Sudan - The project supported the Ministry of Agriculture to create a template phytosanitary certificate, a document required for the international trade of agricultural produce. The first phytosanitary certificate was issued by the Ministry of Agriculture for the first shipment of coffee that was exported to Nespresso in July 2013. First coffee ever exported from South Sudan - A shipment of 1.8 metric tons of green bean coffee airfreighted to Nespresso in 2013 was the first export of coffee from South Sudan. The first export by land of coffee from South Sudan took place in July 2014 when 10 tons of parchment coffee was transported to Uganda, also destined for Nespresso. First ever non-oil export from South Sudan to Europe - An official in the Ministry of Agriculture reported that the shipment of coffee to Nespresso in 2013 was the first ever non-oil export from South Sudan to Europe. First exporter identified and trained - A local South Sudanese company was identified to provide the service of exporting coffee from South Sudan to Uganda. The company imports packaged food products from Uganda and thus had the relevant experience for handling coffee and dealing with customs requirements. First coffee export tax revenues to government - The County Government in Yei collected export tax revenue from the coffee export in 2014, the first time the tax has been collected on coffee. First legal processing and export of foreign coffee through Uganda - While coffee has long been smuggled from the Democratic Republic of Congo into Uganda for re-export, this was the first legal importation of coffee into Uganda. Over the next year, Nespresso and TechnoServe will continue to support the three coffee cooperatives through the upcoming harvest season by providing coaching on coffee quality and business skills and develop the marketing channels for coffee. See the post and read more about Nespresso’s sustainability strategy.